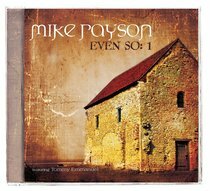 Even So:1, the latest release by Mike Rayson, is not your average 'worship songs' CD. It is crafted as a service of corporate worship from the beginning to the end. Great hymns of the church with a new contemporary twist like 'O For a Thousand Tongues To Sing' and 'My Hope is Built on Nothing Less', give way to readings from scripture and powerful prayers. Even So:1 features guitar legend Tommy Emmanuel - including a vocal duet with Tommy on 'Softly and Tenderly', plus Joanne Lester and friends from Hope 1032 in Sydney; Lenny Firth from Adelaide; the Rev Tony Miles of London UK, Mike's own children Laura and Oliver and others. This service of worship on CD comes to a mighty crescendo in the song 'Here I Am - I the Lord of Sea and Sky'. Make sure this beautiful CD has a place in your collection today.